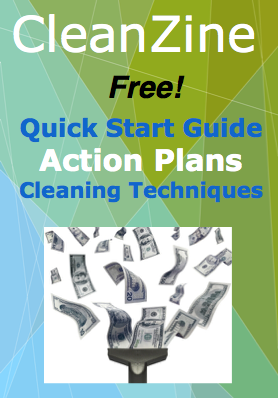 Looking for ways to earn more with your housecleaning service? Think dirty! If you are willing and able to provide these four extra services seasonally, you can easily multiply your earnings. Sidings, windows and screens are not generally part of the housecleaner's job. However, these items should be cleaned about twice a year. Trash bins are another often overlooked item that require regular cleaning. Experts recommend that trash cans be washed every other week or two, to prevent gummy buildup, kill e coli and other dangerous bacteria, and discourage animals from making a mess out of garbage. Some additional cleaning equipment may be necessary. You will need large (5-gallon) buckets, soft scrubbers, brooms, towels, and access to a garden hose. One optional tool that will save you time is a pressure washer. Pressure washers can reduce or even eliminate the need for scrubbing vinyl siding. Rent or purchase one from your local hardware store or tool-rental company. Interior window-cleaning may require a sturdy step ladder and an additional person to help keep you safe while up on a ladder, scrubbing. Wood or vinyl are the most common types. Dust and cobwebs require only a garden hose with a sprayer attachment. Get an all-purpose house cleaning detergent that comes in a container designed to attach to the garden hose. For heavier grime and caked-on dirt, you may need a soft scrub brush on a long handle. Use along with the house-detergent spray, or mix a few squirts of dish or laundry soap in water. We use Seventh Generation dishwashing liquid. I prefer this brand because it works well but isn't too sudsy, so it rinses off quickly. Rule of thumb: Wash from the ground up, rinse from the top down. Use a pressure washer for really grimy siding. Adjust the pressure to 300 – 500 pounds per square inch, no more. Work in small sections of the house at a time, about 3 – 5 feet square. Use safety precautions and take care not to damage wood or vinyl siding. Spraying too hard or too close can force water to penetrate the seams of vinyl siding, which can create mold problems in the future. It helps to hold the sprayer wand out several feet away from the house. Both wood and vinyl siding is susceptible to stains, mold and mildew. Chlorine bleach and water can be used effectively to remove mold and mildew. Allow the solution to sit on the surface for about twenty minutes. Bleach will lighten the color of wood, so be careful to avoid discoloration. Window screens can gather and hold cobwebs, dust and leaves. They should be scrubbed clean at least once a year. You can offer this service in the fall for homeowners who remove their screens and store them over winter. In the springtime, offer to spray-clean and remove dust from screens and tracks before reinstalling. Spray with garden hose and sprayer attachment. Allow to air-dry. Lay screens flat on outdoor table, deck, patio or driveway. Add two squirts of dishwashing liquid to bucket of water. With a soft nylon brush, scrub screens gently, one side at a time. To rinse, spray with garden hose. Allow to air-dry. Clean metal window tracks with a stiff bristle brush. The windows of a house are like the eyes of a person. Cleaning windows lets the inner soul shine through! Exterior windows can be cleaned quickly, without a ladder. Purchase a bottle of window-cleaning detergent that attaches to a hose. Spray dirt and grime away. Interior windows may be cleaned with a steam-cleaner, or with a squeegee and a mild solution of liquid dishwashing detergent and water. Use microfiber cloths to polish glass to a shine. Trash receptacles can get really gross and untidy. Insects and animals are drawn to smells that we can somehow ignore, that is until we have to open the lid and toss out more trash. Clean the outside of trash cans using a long-handled brush. Wear waterproof gloves for skin protection. Mix a ¼ cup of liquid laundry detergent and ¼ cup of liquid chlorine bleach in a bucket of hot water. Clean the inside of the trash can with remainder of the sudsy solution. Scrub off scum with a mop or brush. Rinse with hose. Turn the bin upside down and allow to drain and air-dry.